When in late summer, the abundance of fruit is staggering, the question arises of what to do with all this wealth. In addition to marinades, jams and other canned goods, you can make homemade dried fruit. Then welded these scented dried fruit compote will remind you of hot summer cold winter evenings. Apples and pears thoroughly. Remove the fruit from the core and cut into slices with a thickness of five millimeters. Berries loop, remove damaged. Nanizhite chunks of fruit on a thick thread, leaving between them small spaces or spread out in a thin layer on sheets of blank paper. The berries are spread out in a thin layer on the sheet of paper, placing it on a stack of Newspapers. Newspapers are needed to absorb moisture. Place fruit and berries in the sun for four days. Can place them under the roof in a well ventilated place: on the balcony or deck. However drying in the shade will take much more time. Every four hours of drying stir the berries and change the wet newspaper to dry. Fruit, laid out on paper, too, need to stir. To drying under the open sky, the fruits and berries did not get dew at night take them in the house. In order to completely dry, the fruit will take from four days to two weeks. The finished dried fruit should be soft, elastic. Dried fruits from apples ideally have a cream color. Properly dried berries, if you squeeze them and should not stick together. In addition, the berries dried in this way, longer retain their medicinal properties. The finished dried fruit put away for safekeeping. Ideally, they should be stored in paper or fabric bags, hanging in a dark, dry well ventilated area at temperature not exceeding 8-10°C. it is Clear that in a city apartment to comply with these conditions of storage is quite difficult. So put the homemade dried fruit in a sealed container and store in a dark place. There they will be protected from foreign smells and moisture. From time to time check stored fruits. If they have mold, you will have to throw them away. 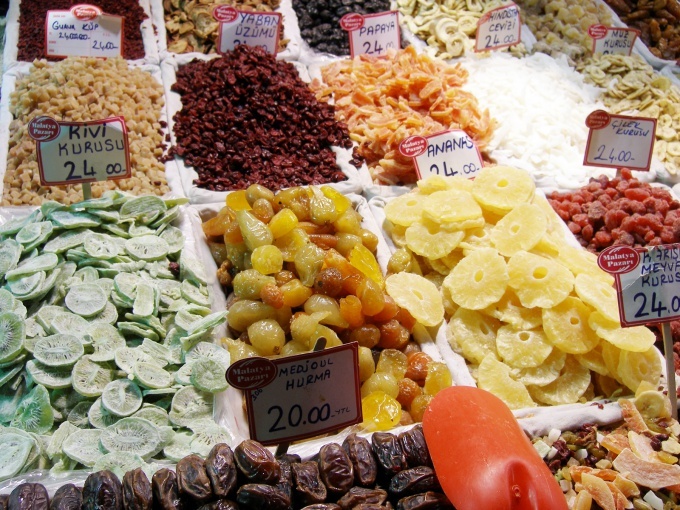 For the production of dried fruit are often used sour-sweet or sour apples. If the weather is not very suitable for drying fruits and berries in the open air, you can dry them in the oven at a temperature of 50-60°C, stirring every two hours.